Sound reinforcement Articles full of advice on stage sound, the music industry, submitting your lyric and music tips to help music makers gain success with the Serious Writers Guild at Makehits.co.uk. Do you Really Know About Sound? So, by now, you should be learning that this industry, we love so much, doesn’t take prisoners and if you are making that transition between smaller venues and larger ones, with bigger stages, there are a few good lessons you could do well to learn. I’m sure you will have read articles about how much at times you are left “at the mercy” of sound engineers, but there is hope, remember there is no place for any attitude other than a professional one. Learn to “make things easy”, and that way the engineer becomes your friend very quickly. Is a massive Sound System Different? If you are playing a gig where you are playing through a large scale sound system where ALL the sound the audience hears is coming from the PA, you have to remember it is very different to playing smaller venues, where the audience hears a combination between your acoustic instruments and backline, and the PA. The main difference is that at the big gig you are entirely at the mercy of the sound crew, if you like it or not! But, (with a bit of luck) you will have one thing in common – you both want the gig to sound as good and as ‘professional’ as possible. So what can you do to help? Just remember the soundman is your friend, so try not to piss him off! If he’s happy, you WILL sound better! (But don’t buy him drinks before the gig!) If you approach the gig with a professional attitude you will also get MUCH more done in the sound checks and you all benefit - the band get a better monitor mix, and the engineers get more time to set up the gain structure of the desk. Is Your Personal Equipment Functioning Correctly? Before you arrive make sure you have checked any cables you are going to be using. On a small system when a cable has a loose connection you may hear crackles and thuds as it connects and disconnects, but, on a big system those thuds become loud bangs that can damage the bass system and the crackles become a loud distortion that is not only potentially damaging to the high frequency drivers but is also annoying and painful for the people who have paid to come and see you. So, the motto… If you have a cable with a loose connection, chop the end off so you CAN’T use it until you’ve fixed it! Also ensure the batteries are fresh on any equipment that needs them as batteries running out of power can cause not only a drop out of the signal but also a drop out of the suppression system that stops hum and interference. Another main cause of problematic hums are grounding problems that we’ve all encountered sometimes. It is essential that all equipment connected to the mains is earthed properly as this reduces grounding problems (your equipment, your responsibility), but also it is worth noting that if you DI a mains powered instrument it is absolutely essential that the mains power is taken from the same power distribution board as the PA and NOT from a separate ring main – otherwise you are connecting the grounds via the ring main and fuse board of the building, which can create seriously bad earth loops; If you get a loud hum in one venue and not another, this might just explain why. On a big system all these problems are killers, as that small earth hum or bad connection become big problems across the whole system; The bigger the system, the bigger the problem. There is one thing you can do to greatly help the sound crew- if you can walk into the venue and hand them a piece of paper that tells them everything they need to know, they don’t need to ask the same old set of questions. Sounds simple but it saves those valuable minutes and means YOU don’t get pissed off ANSWERING the same old questions… So what needs to be included? Your standard stage layout with each mic/D.I. clearly shown where they need to be. Feel free to indicate mic preferences but you might not get them so if you require a specific vocal mic, bring it with you! Your preferred stage monitoring positions listing what you want to hear through them in order of importance. This will enable the sound engineer to reasonably ‘guess’ the monitor mix you want making the fine-tuning much quicker and easier during the sound check. Also indicate where you usually stand to play/sing on stage preferably showing a ‘base position’ but also indicating the areas you move into – this also helps in setting the monitor mix before the sound check and can affect the positioning of microphones. When you sound check every mic/D.I., what the engineer wants is your ‘maximum playing level’ – by this he means, play your instrument as LOUD as you ever will in the gig, gigs always get louder towards the end and musicians, whoever they are always underestimate how much noise they make after 5 pints when they’ve gone slightly deaf. So, if you want to shout, back off from the mic and then you can shout as loud as you like - this ‘normalizes’ the level to something close to the level of your normal singing voice, and the sound man will be happy! DJ's...Yes It Applies To You! And, yes, this also applies to all you DJ’s out there. Believe it or not, the VU meter on a mixer is there for a very good reason, as are the red LED’s at the top! Metering is included in all mixers to allow the DJ (or sound engineer…) to ‘control’ the output levels - every track ever recorded has a very slightly different output level and tonal bias, with some that are quite dramatically louder than others. If you set up the gain controls so that the VU is peaking around 0dB, if a track is louder or quieter, the metering tells you to turn the channel gain up or down. Simple you may think, but all too many DJs run the levels right into the red and beyond, in an effort to make it ‘louder’ but in reality, they are driving the mixer outputs into distortion and the engineer will have no choice but to just turn it down to stop the distortion destroying the HF section of the PA system. The same applies to idiotic use of the EQ – One ‘professional’ DJ I was engineering in the past decided there wasn’t enough bass and put a sudden +25dB boost on the bass EQ, and blew all the bass drivers instantly; show over, and no amount of compression/limiting could have stopped it. You can imagine how popular he was afterwards! The lesson is, as a rule, adjust EQ’s negatively, not positively and you can’t do any harm at all (and it sounds better too, some mixers get around this by having a 20db pad on the output or even adjustments to the metering scale). Don’t get me wrong, I’ve worked with many talented, truly professional DJ’s, and it is always a great pleasure, but sadly many DJs, as well as musicians, have a lot to learn… More about metering and EQ. Another point to note is that at a small gig, if you mic a up loud distorted guitar amp, the level of sound the audience hears coming from the amp compared to the PA may be about 50/50 making your sound really muddy and different all around the room – so you may as well bring a bigger amp turn it up a little and not mic up the cabinet. It's impossible to engineer a band when the guitarist is louder than the lead singer down the lead vocal mic! 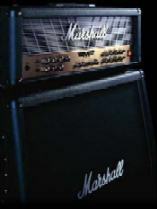 Having said that, a Marshall stack used “responsibly” sounds better than pretty much any other but do remember the responsibly bit and maybe even don’t jack in the 2nd 4 x 12, just use it as a stand, you wouldn’t be the first - believe me! "In Oct 2002 Dec Cluskey was honoured as one the the top forty most influential people of the past forty years in the Music Industry by Marshall Amplification. He was presented with a gold plated Marshall Stack" - Could he help your music career? Another helpful tip if you are one of those people who require very high volume levels on stage, position the backline cabinet facing sideways across the stage (and preferably not directed at any other microphones, especially the drum kit and vocals) rather than pointing towards the audience as this negates the ‘doubling’ of the sound the audience hears. As you will notice from the picture of Seize The Day in our photo gallery (Glastonbury Left Field 2003, straight after they were banned by the BBC…) it is possible to amplify multiples of acoustic instruments on a relatively small or large stage without the sound becoming muddled and without it being a constant battle with feedback. But not to fear! We can reach for the trusty active D.I. box (preferably phantom powered). The fact that the P.A. WILL (or should) produce those lower bass frequencies means the EQ on the amp head isn’t needed in the same way, so the line from the bass (or any processor) should go straight to the D.I. box where it is then split, one signal fed to the backline amplifier for your stage sound and one taken direct to the stage box / multicore and back to the engineer at the desk and you will be amazed at the extra depth in bass this creates in the F.O.H. sound. Drums are perhaps the single most complicated instrument for anyone to reproduce, particularly the bass drum. Its not just an inability to play that has made people turn to sampled drum sounds, it’s the fact that drums are very difficult to get right on stage and by using a sampled sound you take the mic-ing up of the kit out of the equation and with the relative cheapness of multi in and out samplers these days it isn’t difficult to set up a kit entirely on triggers with all the sounds coming from a sampler in a rack behind the kit. But, I have to say as an engineer one of the most rewarding things is to be able to get the sound of a full kit right and balanced with the full tonal range only achievable on a “real” drum kit with a “real” drummer playing it, and it doesn’t take that much thought really. on our web site if you’re interested. Do just check before you play and make sure none of the mic’s are in a position where you might catch them with a stick, each drummer has his own style and quirks, in hand movements. A quick visual check and a word with the sound man can save you the embarrassment of hitting a mic and the engineer the cost of a new diaphragm. To begin to understand dynamics, choose a C.D., from your collection, which has loud sections and quiet sections that work well. Play the c.d. and watch the meter levels, even though the quiet bits may sound VERY quiet the difference in level between loudest bit and quietest bit should never be more than 10db otherwise the loud bits become TOO loud and the quiet bits disappear completely or are too quiet to make the impact they were written to do. If you don’t control the dynamics of your voice or instrument, then the engineer has to spend all night changing levels to make you heard or quieten you down in the mix instead of being able to concentrate on the reproduction of the actual sounds or the intricacies of a certain song! Dec and his band....The Bachelors....at home with the biggest of sound rigs! Postal address; 30A Carlton Road, Worksop, Notts, S80 1PH.